Bambi Linn is now 92. The New Yorker magazine caught up with her recently, at the “Carousel” revival. It opens next Thursday (April 12). 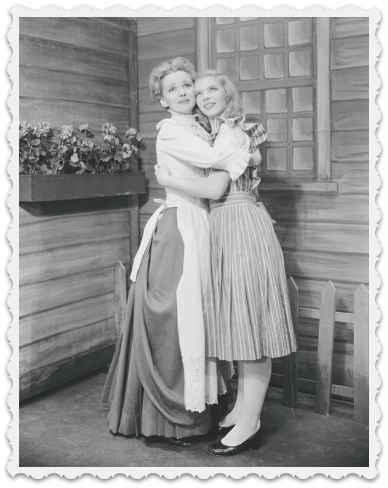 Bambi Linn (right) as Louise, and Jan Clayton (Julie Jordan) in the 1945 production of “Carousel.” John Raitt played Billy Bigelow. The New Yorker “Talk of the Town” story called Bambi Linn “petite and zesty.” It described her encounters with Renée Fleming, who now sings “You’ll Never Walk Alone,” and Brittany Pollack, the current Louise. It zips through Bambi Linn’s past (at age 6 she studied with Agnes de Mille; during “Carousel” she had enough downtime to go across the street to watch Ethel Merman in the 1st act of “Annie Get Your Gun”), and touches on the different ways in which the 2 productions — nearly 75 years apart — treat Billy’s beating of his wife Julie, and slapping of his daughter. It’s a typical New Yorker “Talk of the Town” piece. You’re never sure what the point is, or why it’s there in the first place. But it gets you thinking about something — or someone — you haven’t thought about in a long time. Like one of Westport’s most famous Broadway stars, of all time. This entry was posted in Arts, Entertainment, Looking back, People and tagged "Carousel" 1945 production, Bambi Linn, Joseph De Jesus, The New Yorker. Bookmark the permalink. In the early 70’s Bambi Linn and Joe Dejesus lived on Hillandale Road near West Parish in an old farmhouse he renovated into a beautiful home. It was occupied much later by a designer from NYC whose name I can’t remember. I remember studying ballet as a young girl with Bambi Linn at the Weston Music Center on Steep Hill Road in Weston! Great to hear news of her and her husband…and to hear about Carousel – coming around yet again! What a wonderful blast from the past to read the article on Bambi Linn. On Saturday evenings In the early 1950’s, my parents, sister and I loved watching Bambi Linn and Rob Alexander when they danced on the TV show, Your Show of Shows. I also remember she had a dance studio on South Compo Road. Holy cow! Dan, does this qualify as another Westport “meets the world” connection to international soccer? I took ballet at Bambi Linn’s Compo Road S. studio. I remember her as a great teacher–kind, but exacting. I knew she had danced in “Carousel,” but didn’t know most of these other details. Once again, thank you, Dan!! Bambi Linn and Joseph deJesus owned a large house on South Compo on same side of street opposite the Baron’s property. In the 60’s they were raising a family in this house and teaching ballet, adult exercise and Joe had his Body Shop in the mornings. I attended classes there several days a week. Bambi devised a class based on ballet, modern dance and weight lifting with Joe. A precursor for all current exercise programs. Bambi Linn mother to my childhood friend, Belinda Linn Dejesus. I was fortunate to share grades 3 through 8 with Belinda at Bedford Elem. & Bedford Junior High School. Belinda’s message to me in my 8th grade yearbook was “don’t forget me”, so I haven’t and won’t. What a life though for Bambi Linn. The barn on Hillandale that was beautifully renovated and was owned by Joe DeJesus I believe was sold to Joel Douglas-brother of Michael and son of Kirk. Must have driven by that studio a million times but never knew the story behind the sign. I also remember the Bambi Lynn ballet studio from when I first began piano lessons at the Weston Music Center,Steephill Rd. Weston,in the early 1960’s-that old barn there was truly a magical place for ballet and music! Quite a blast from the past! As with previous posters, I too studied at her ballet studio on Compo Road in the late 60’s (?) I also remember using her studio to rehearse some of the dance numbers for a Staples Players’ production of “Oklahoma”. (Probably around 1974). Didn’t she dance the ‘Dream Laurie’ sequence in the Shirley Jones/Gordon MacRae production? Great to hear that she and Joe are still out and about! My Staples Players “Oklahoma” program mentions the dream sequence was “choreographed after Agnes De Mille, by Bambi Linn”.